The College Valley is undoubtedly one of the finest in Northumberland as it stretches from the tiny hamlet of Hethpool to the open jaws of the spectacular Hen Hole and the lonely border with Scotland. The valley is surrounded by a plethora of hills of various shapes and sizes from where a cornucopia of outstanding walking routes start and end. 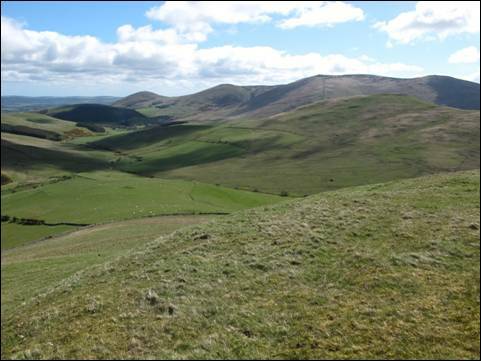 This unique walk initially follows in the bootsteps of the Northumberland National Park`s Hillforts Trail as it heads towards Ring Chesters via both White and Haddon Hills. Along the way distant views will constantly catch your eye and, once you have reached the hillfort-topped Ring Chesters, you will leave the sign-posted Hillforts Trail behind and make your way downhill to the farmstead of Elsdonburn. After briefly following St Cuthbert`s Way your route will then head to the grass-covered top of Ell`s Knowe, rarely visited and none the worse for that. Next it is time to make tracks for the border and the highest point of your walk where, once on Scottish turf, you will visit White Law and its superb subsidiary west top. Outstanding views abound. Finally, once you have devoured every morsel of the wall-to-wall panorama and in all probability your lunch, you will begin your return route to Hethpool eventually crossing the hillfort-crowned Great Hetha, the final summit of your walk. It is, literally, all downhill from here. 1. Described, rather conservatively, in the 1969 published book, `Northumberland National Park Guide No. 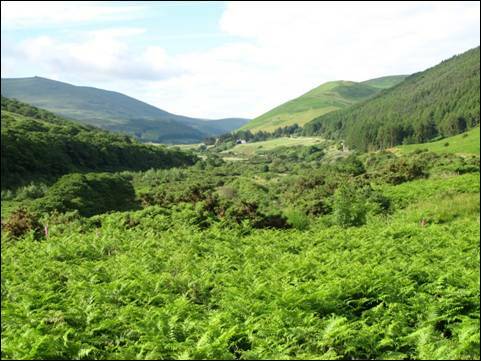 7` as, “pleasant and secluded”, the College Valley makes an instant impression as the single track access road squeezes between the flanks of White Hill and The Bell before then descending towards the tiny hamlet of Hethpool. To your left Easter and Wester Tors, the twin siblings of Newton Tors, sweep down to the flat valley bottom like two giants standing guard over one of Northumberland`s finest jewels, whilst straight ahead the valley stretches as far as the mighty Cheviot, the county`s highest and best known hill. The view is simply outstanding and this is before you have even fastened up your bootlaces, checked the contents of your sac and started on your own Elsdon Burn Border Round. First, park your car in the small car park which is shielded to the north by a small plantation and lies on the left hand side of the road just beyond the 1919-built row of attractive Arts & Crafts style cottages. Once you are ready to roll, turn your back on the road ahead and wander back the way you have just travelled with the row of fine cottages now on your left. Continue with the road as it makes a 90 degree turn to the left passing almost immediately the entrance to Hethpool House once home to industrialist and former Mayor of Newcastle upon Tyne, Sir Arthur Munro Sutherland. The house now provides B & B accommodation. Pause for a moment and peep behind the attractive left hand circular entrance pillar and you will see a cleverly concealed Post Box. 2. Continue along the road, crossing over the chattering Elsdon Burn, and then, when you reach the next bend in the road, turn left. You will see that there are a series of sheep pens lying to your left. 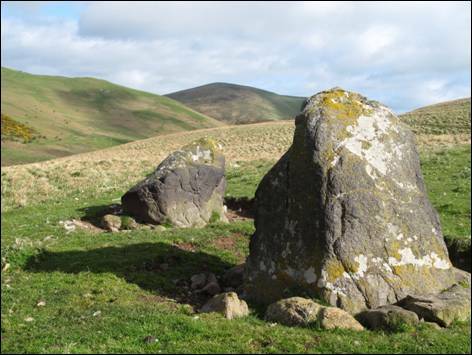 You are currently travelling along the route of both the `Ring Chesters Round`, one of four waymarked Hillforts Trails in the area, and the 62.5 mile long St. Cuthbert`s Way which links the Scottish border town of Melrose with Northumberland`s Holy Island. Almost immediately you will see a signpost on your right indicating `Ring Chesters 2` and this is now your direction of travel (GR NT893285). You are leaving St. Cuthbert`s Way behind, although you will meet up once again for a brief time later in the walk, and are following the waymarked `Hillforts Trail`. As you climb gently uphill you will perhaps spot the well-preserved cultivation terraces across the slope of the hill where ancient inhabitants once grew their crops. It is not known for sure when these terraces were first made although it is quite possible that they were used as long ago as medieval times. As you continue uphill be sure to keep your eyes peeled for the intermittent marker posts as the path is indistinct in places. Once the gradient begins to level out you will see, to your right, a grass-covered track (GR NT889289) heading uphill to the top of White Hill. Take this track always making sure to head towards the highest point and, eventually and without any real effort, you will reach the unmarked top of White Hill, some 228 metres (748 feet) above sea level. Small in height but big on views, this hill sets the scene for the remainder of the walk; panoramas galore. Take a moment to enjoy the first of many. 3. You now need to leave the top of the hill by heading in a south westerly direction aiming for the edge of a small plantation and, as you move closer, the two prominent `standing stones` nearby. Beyond, you will spot a five bar gate and an adjoining stile (GR NT887289). These impressive stones mark the site of a burial mound dating back to the early part of the Bronze Age although the mound has long since been robbed of all its stones except these two. Cross over the stile ahead and continue along the clear green track to the marker post part way up the obvious ridge ahead. At the marker post turn left uphill crossing the difficult to detect earthen ramparts of an old hillfort. Stay with the track over Laddies Knowe as it makes its way towards a part-harvested plantation boundary. Before reaching the boundary fence you will come to a marker post (GR NT879287) which indicates the way forward towards Black Bog along an intermittent path. In time, and after plodding through some potentially damp ground, you will reach and cross over a small stile. Continue forward whilst keeping the plantation boundary close by on your left. Stay with the wall when it makes a sharp turn left to reach a gate into the plantation, now denuded of many of its trees. 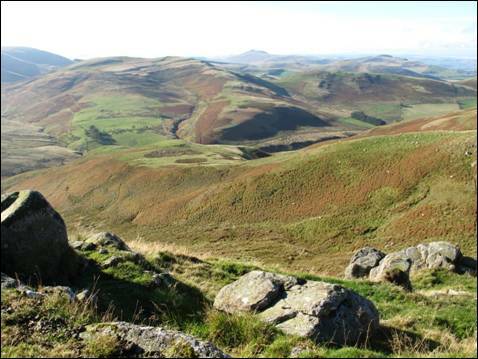 The panorama is simply stunning; Ell`s Knowe, Madam Law, Sinkside Hill, Loft Hill, Saughieside Hill, Black Hag, The Curr, The Schil and last but not least, the mighty Cheviot. Feast your eyes before entering the plantation and following the path as it bends to the right over Haddon Hill. 4. Stay with the path steeply downhill with tall, mature conifers immediately on your left and, when you reach the bottom, cross over the stile (GR NT868290). You are now standing on the saddle between Haddon Hill, behind you, and Ring Chesters immediately ahead uphill. To your right, the public footpath heads towards Elsdonburn Shank whilst downhill to your left lies the quiet farmstead of Elsdonburn. You will pass the latter in a short while but first, a visit to the hillfort-crowned Ring Chesters. So, take a deep breath and off you go straight up the steep slope ahead to reach the double ramparts of what has been described as, “one of the most stunning hillforts in the National Park”. Take time to explore the remains of the hillfort and to enjoy the excellent view in all directions. Once done, continue across the top, descending to a small col before turning left with the track on a downhill trajectory. Eventually, you will splash your boots through the Elsdon Burn via a shallow ford as you make your way to a large iron gate and an adjacent stile. Cross over and proceed as far as a sign post indicating `Border Ridge`. Turn right on a gravel track passing as you round the bend the modern bungalow of Elsdonburn Farm (GR NT873284). The `Hillforts Trail` has now been left behind and you have once again joined the route of St. Cuthbert`s Way if only for a very brief encounter. Watch out for passing pilgrims as you follow the track until it decides to split in two. The main track, and that of St. Cuthbert`s Way, takes the right hand fork whilst your route takes the left hand one, more or less straight ahead (GR NT870280). This track wanders forward, gently stroking the lower slopes of Ell`s Knowe, as it makes its way towards a plantation. Stay with the track as it runs alongside the plantation, gradually gaining height, until the boundary fence makes an abrupt turn to the right (GR NT869275). 5. This is the place where you must now turn to your left and start the short, sharp climb to the top of Ell`s Knowe by aiming for the highest point over essentially pathless terrain. The grass is generally well cropped on this out and back detour to one of the areas less visited hills. Once you have reached the unmarked top (GR NT872278) you will realise that the extra effort has been worthwhile as you peer down on the now tiny farmstead of Elsdonburn, look out towards Haddon Hill and Ring Chesters and feast your eyes on Newton Tors, Yeavering Bell and Great Hetha and the prominent ramparts of the hillfort that encircles its delightful summit. You will get a closer look at these ramparts towards the end of your walk but for now just enjoy the moment. Once done, retrace your steps to the plantation corner and then follow the south eastern boundary towards a five bar gate. Go through and continue more or less straight ahead, in a generally south westerly direction, as you slowly but surely plod your way towards the summit of Madam Law. In time you will meet up with a fence and by keeping this close to your left hand side you will very soon reach a small walker`s cairn which marks the top of this 397 metre (1302 feet) high hill. Once again the panorama is extensive as you pause to catch your breath beside this neat little pile of stones. Continue to follow the fence across the top and then downhill making sure to turn 90 degrees to the left when the fence does the same. This is Wideopen Head. Go through the gate when this is reached and then, keeping the fence on your right, head uphill on a sometimes muddy quad track. 6. At the top of the rise you will come to a small gate and the junction of two post and wire fences. You have now reached the border with Scotland and the top of White Law, at 430 metres (1411 feet) the highest point of your day (GR NT857261). Go through the gate onto Scottish turf and also join the route of the Pennine Way, the first long distance trail to be officially opened, way back in 1965. In his 2012 guide to the Pennine Way, outdoor journalist and walking fanatic Damien Hall said, on reaching this spot, “the summit yields yet more wondrous views” and indeed it does. An equally superb viewpoint is our next port-of-call, the western spur of this fine hill. You will come back to this lovely spot on your return journey so, with your back to the gate, turn right and follow the fence downhill to Whitelaw Nick the point where the Pennine Way climbs over the ladder stile still keeping to Scottish soil, heads downwards on the final part of an epic journey. The finishing tape at Kirk Yetholm is almost in sight. 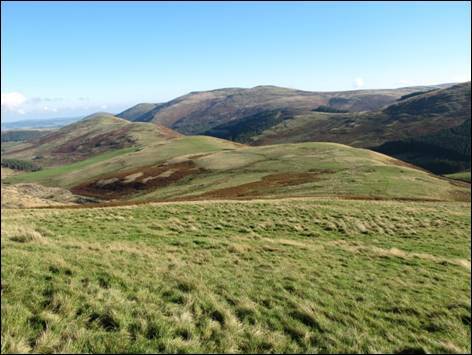 In his 1926 published book, `Walks from Wooler`, W. Ford Robertson said that there was, “a convenient gate” at this spot and that you can, “look down upon the head of the Halter Burn valley”. Your route ignores the stile and heads sharply upwards with the post and wire fence and a dry stone wall, or more precisely a dry stane dyke (we are in Scotland after all), immediately to your right. The top (GR NT852261) and the upper slopes of this superb spur offer some of the finest views in the Cheviot Hills and it would be almost criminal not to linger here awhile. If you have not already raided your sandwich box, now would be the ideal time to do so. Just sit back, relax and enjoy every aspect of your grandstand seat. You have deserved it. 7. 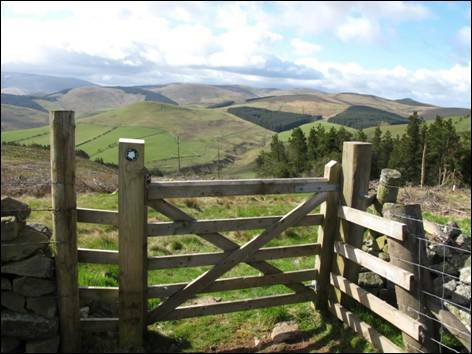 Alas, you cannot sit here forever so pack away your bait, get onto your pegs and return the way you came, first to the top of White Law and then, after passing through the small gate, gently downhill to Wideopen Head. From here your route continues to follow the main track, a designated public footpath, that bends to your right as it contours the south western side of Madam Law eventually turning eastwards (GR NT864263) to face your next hill, Great Hetha. At this point, if you glance to your right, you will see the magnificent Trowupburn Hope stretching out towards Black Hag and The Curr, flanked by Steer Rig on one side and Shorthope Shank on the other. Ahead lies the route to Great Hetha across what is, in essence, one long undulating ridge, culminating in the summit of the final hill of your walk. Whilst there are some quad track along the way the best approach is to keep to the crest of the grassy ridge making sure at all times to keep Great Hetha firmly in your sights. The underfoot going is superb, well cropped grass with the occasional green track to guide you to the only gate along the way. After going through this large metal gate you will pass two fairly substantial cairns before heading briefly downhill to join a single track Tarmac road (GR NT8). Be aware of the small unguarded quarry to your right immediately before reaching the road. To the right, the road falls away to the remote farmstead of Trowupburn whilst to the left it leads either to Elsdonburn or back to the College Valley. 8. You are now well on your way to the end of your walk but, first, the simple matter of Great Hetha, the muscle-testing sting in the tail. Walk a short distance to your right and then leave the road to your left to cross over a small stile lying to the right of a picturesque strand of trees. Ahead, a clear green track begins its winding journey uphill with the occasional `Hillforts Trail` marker posts to keep you on course and, eventually, you will pass through the stone ramparts of one of the most impressive hillforts in the College Valley area. 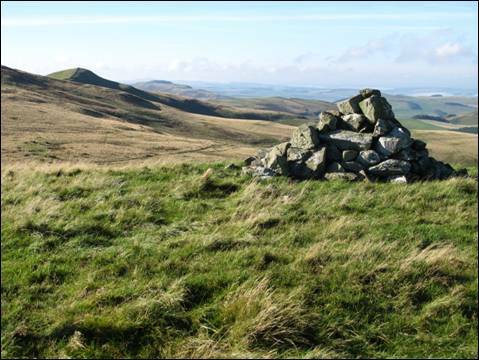 The small stone cairn marks the 343 metre high (1125 feet) summit of this small but exceptionally fine hill (GR NT885274). The panorama, which includes the north face of the mighty Cheviot with both the Bizzle and Braydon Crag especially prominent, is outstanding so spend a little time wandering around the summit area. Then, when you are ready to call it a day, start you downhill walk back to your car by continuing in the same direction as you arrived following the odd helpful marker post. When you reach the fence and the small plantation, bend with the path to your right and follow the edge of the trees to the valley road. Turn left and before long you will have finished this fabulous walk on both sides of the border. Now for a cuppa, a bite to eat and the long journey home. Hethpool Car Park, College Valley (GR NT894280), (GR NT893285), (GR NT889289), (GR NT887289), (GR NT879287), (GR NT868290), (GR NT873284), (GR NT870280), (GR NT869275), (GR NT872278), (GR NT857261), (GR NT852261), (GR NT864263), (GR NT885274). Mainly clear paths and tracks over undulating countryside with a number of reasonably steep ascents and descents. A variety of accommodation available in Wooler including the Wooler Youth Hostel. Alternatively, Hethpool House or the Mounthooly Youth Hostel both in the College Valley.